About This is the second in my series of frozen images. 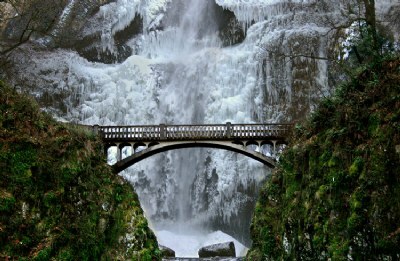 It's a closer view of the bridge at Multnomah Falls of which I posted the entire waterfall in my previous post. I liked this because it shows the frozen icicles all around it and I thought it had quite a dramatic feel to it. Enjoy! Thank you to all who may drop by to view and comment on my images. spectaculat.great compsoition. outstanding. wonderful portfolio. This is magnificient scenery, Ann. It must be cold to freeze a waterfall this big. Wow! Great pic. Glad to see you're still around I hope you see the photo I put up especially for you. Cheers, Ann. This is marvelous. The shape and expanse of the water falls looks like a ghost with outstretched arms--a friendly ghost guarding the bridge and those who cross it. Seeing the water frozen is wonderful. Your composition is beautiful. Many of the comments I would make on this image I already made on one of your other images of this setting. I simply want to say another job superbly done. This place looks mythical to me - makes me want to visit it and soak in its ambience. Beautiful! The juxtapositioning of lush greenery and winter ice makes the compostion work for me - along with the sheer drama of rugged falls behind the delicate bridge architecture. S T U N N I G !!! Beautiful! I have several shots of the falls on a trip up the Columbia gorge I did a few years ago but it's awesome to see it frozen. Nice framing and composition using the bridge as the center point. really looks like something from the sci fi movie. the light is incredible - especialy on the bridge. a real treat - I'd be there for hours seeking out all the little icicles with strange (and rude!!!) shapes! three very impressive capture for this fall, wonderful colors, contrast and I really like the composition of this one. Very well done. A lot more dramatic than the entire view one,but you seem to have forgotten that nasty experience you went through a couple of months ago!!!!! Please take better care of yourself,Ann. How (cool) is this. This is my favorite of the shots. I fell like I'm in In the land of "Narnia" I'm just waiting for the Ice Princess to ride over the bridge in her sled. Wonderfully mystical looking.Great capture. Wow, what a splendid balanced beauty, very masterfully done. Ahhhhh! This looks somehow like a huge organ!!! Very beautiful! It must look awesome in reality, face to face with those frozen shapes!And the bridge looks very attractive from closer up. I'm just waiting for the organist to sit down and start the concert! Ann, this is amazing! I love the composition and the symmetry! The close-up is more spectacular than the whole, in my opinion, this is my favorite because it has a special mood: you portrayed the freezing cold so well! The colors are cool and the detail is fantastic - the bridge, the icicles, the greenery and the big boulders. Stunning! Great telephoto. It's the land of the Ice King and Queen! Very nice! WOW Ann, this is breathtaking!!!!!!!!!!!!!!!!!!!! I can't get enough of it...it's just too outstanding...into my favs! Thanks for your comments again! Supercalifragilisticexpealedosious shot!! Well that say it all now doesn't it... LOL!!! very great expouser and a wonderful composition ,perfect contrast and details ,I did enjoy viewing both images in this serie ,wishing you all of the best my friend. That does look cold. Like the ice and bridge. Falls are still falling well. Excellent image and capture. Now this is even more breathtaking sweetie. The details are awesome. I think you should have bribed some daft b----r to stand on the bridge while you took the shot. Had I been there I'd've done it for a kiss....all in the interests of photography, of course. wonderful angle & composition , well done Ann , Kind regards . Ann I like this very much! I think is my favor. A spectacular view, Ann! The frozen spectacle is great, but I really like the contrast between the ice and the lush green foliage of the trees on either side. Wow, the greens are spectacular, Ann! I can't say enough about the frozen falls, they really are quite captivating. Excellent work! Ann I love them both! The first (I missed it somehow!) is so impressive with that long frozen waterfall. I like this one because you can see the bridge better, but I can't decide! Both are gorgeous. It's so nice to see some posts from you. Happy new year! This is beautiful. Goodness you do get around for an Aussie girl. This is just the right perspective to show off the bridge and still see the detail of the ice. I am trying to guess where you were standing when you got this shot. There must have been a viewing platform of some kind. Very well done. an excellent shot. Del. Excelente composición... colores, texturas, definición, luz... una belleza y armonía de elementos: Felicitaciones!!! brrrrr! This place looks cold! The bridge really gives perspective to the size of the ice. Interesting contrast between the ice of the fall and the green foreground. I like t his one Ann, it looks so cold. Like a fairy land.. Great work. Don. What a great and powerful image, Ann! This is just wonderful! For some reason I missed the first upload of this, but I went back and looked at it, and it is very nice too. I have to say that I prefer this one, though. It seems to have a stronger effect closer up. I sure glad to see you posting again! This is absolutely stunning Ann! I had a look at your previous post of the whole waterfall (both in winter and autumn) and all I can say is WOW! This is such a moody and inspiring place. Your portfolio is quite spectacular too. Keep up the good work! This is a spectacular image. I like the contrast of the greenery and the ice.